Driving back from work today, I gun the throttle to take a nice sweeper off ramp, then..
Oil slick trail behind tire. Oil light comes on. I turn the engine off quick, take it out of gear. Cruise into a nearby gas station that also conveniently had a service shop in it. Oil everywhere. Open the hood, nothing clearly visible. 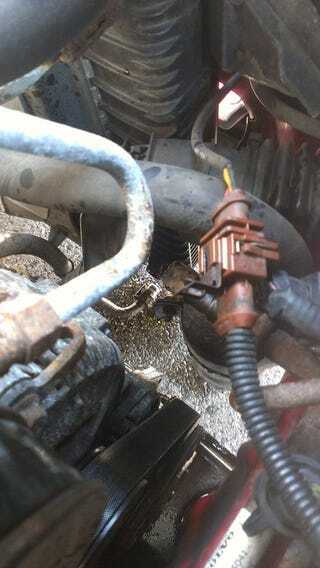 I look abit deeper, oil cooler line into the radiator blew up. I guess the sudden acceleration caused the crappy rusted clip to give, then the pressure pushed the lines apart. Good news is, I didn't seize the engine cause I shut it off quick, Towing cost a $10 tip because I have AAA, towing took 37 minutes from calling AAA to getting the car in my driveway, and the clip and rubber gasket was $11 at my Volvo dealer. Bad news is the car has to sit till at least monday, because a stupid clip and 2 gaskets needs to be shipped from Sweden. Boo.